﻿ Haevichi Resort Jeju, Jeju Island | FROM $164 - SAVE ON AGODA! Have a question for Haevichi Resort Jeju? This seaside luxury hotel, located on Pyosun Beach, is located close to the Jeju Folklore Village. 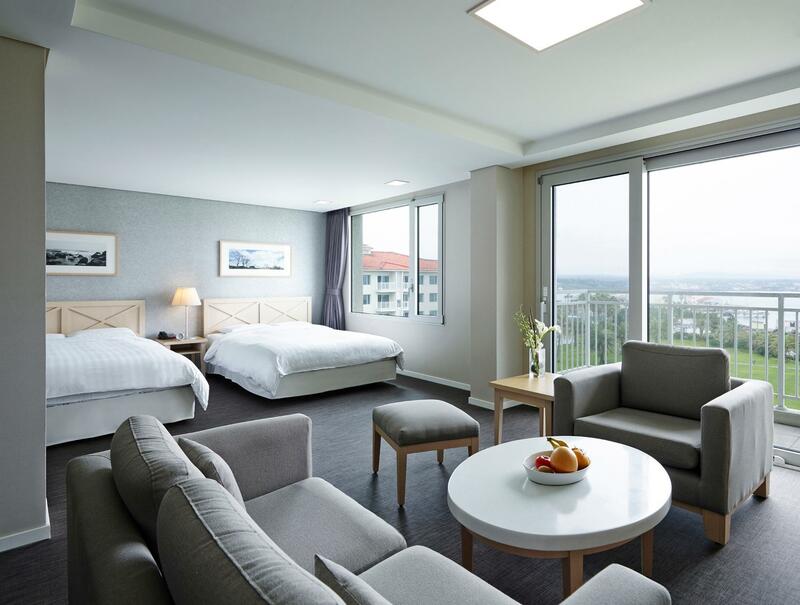 Haevichi Resort Jeju provides guests with an ideal location that is within close vicinity to a multitude of amazing attractions as well as stunning scenic backdrops, perfect for a picturesque holiday. 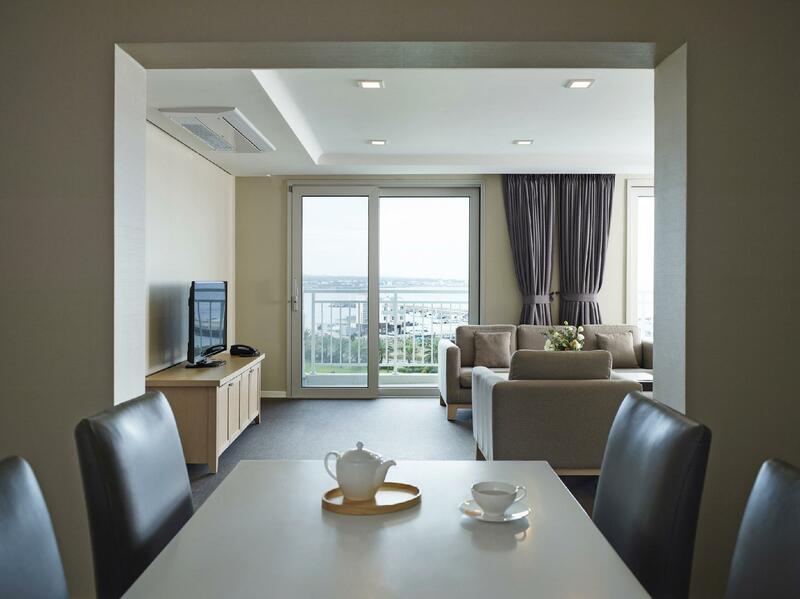 The hotel is eight stories high and adorned with ultra-modern furnishings that borrow concepts of the surrounding maritime ambience to produce a wonderfully calming atmosphere that is perfect for visiting families or large group reunions. 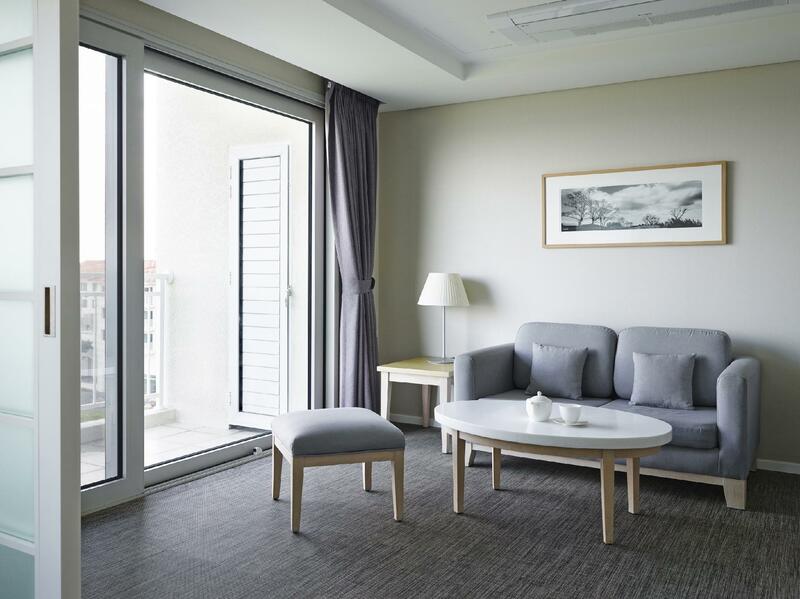 The Haevichi Resort Jeju is the ideal destination for those who look for a scenic seaside resort. Please note that guests are requested to specify the bed type (Double bed or Twin bed) in the Special Request Form upon booking. i want to stay at least 10days in this hotel, very good. I think the employees want to control their customers and sometimes want to ignore them. They seem to believe they have superior competence and status than customers. Sometimes it can be true, but they have to hide it front of customers. Their words were not rude to treat the customers, but they didn’t give enough information and I pumped with their dismissive manners. Actually the treatment ruined my holiday mood with their attitudes. For example, if you use a swimming pool, there is no accurate guidance about the locker room. If you ask again, you can see their nasty faces. There also is not enough explanation and guidance on the menu in the bar (bar 99) at Dalvichi program from the employees. When asking about the menu, you can also see another annoyed face. At the bakery, you might also see unkind face, but when the supervisor came, she changed her face. The attitudes of employees are clearly different between when there is a supervisor and there is not. Even I really enjoyed the delicious pastry at Margaux, but I really don’t want to visit it again. I just stayed 1 night at this hotel, but I met quite a lot of unkind employees. As a Resort, the name implied that it must be a comfortable place for you to relax; but this time was really a bad experience. I booked the room "Superior Twin with mountain view" but my room was faced to side entrance of Hotel besides and was on 7th floor although I request a higher floor, but it was 4 storey above the ground actually and it was the last room [尾房] on that floor. I am A Chinese which didn't like that kind of room and it was very noisy when you open the balcony door and side window because the room was faced straight ahead to machinery room of Hotel besides. Moreover, the bathroom had a strongest smell of insecticide I think which there was no guest to check in for a long long time. The carpet on the floor was broken with so many scars on it. However the twin bed was OK if there was ONLY ONE ITEM to evaluate this resort by "TWIN BED". As my title said that if you are local people or Japanese, I think your stay would be better than being a Chinese stayed over there. relaxing and quiet hotel great location near to a lovely beach. The hotel rooms were large and modern, great big bathrooms with good shower. I did not like the fact you had to pay an extra 10,000 won for the pool. After having paid per night for the room. The front staff was not polite at all and I did not feel a good service. Spacious and confortable room though. First thing to note if you're trying to book the fancy glass building: it's NOT the resort, it's Haevichi hotel! They are adjacent and part of the same group, but different establishments with different prices. You cannot ask to switch. We were really hoping to stay in the "IRIS" room, as this was our honeymoon so we were willing to shell out a bit more, so it was a bit disappointing. The resort was much more of a family place, with a kitchenette and small living room. Decor ok, minimalist and clean but not impressive. Not sure I would pay this price next time for the resort, can't say for the hotel. Location is pretty but really quite far away from everything else. But in some ways that is a plus if you're looking for a peaceful holiday. Don't eat at the hotel, overpriced though decent food. Try looking in the vicinity for some nice local eats, or drive further afield. The price is not high. And the room is so big, very clean, very comfortable. If I go to Jeju again I will stay in this resort for sure. It's the best for everything. Swimming pool is good the parking is easy to find. The room has kitchen and living room. The restroom is very big. The bed is very comfortable. Stay this hotel you will be very happy and great time in Jeju. But it's not in Jungmung but it's great anyway. we had a very good experience staying there. all staff are helpful. room is big with separate living / dining room & an open kitchen which is fully equipped. so, we cooked twice. i'd highly recommend to other people. It is convenient to get to the hotel by shuttle at the Jeju Airport. The location is good that you can visit the famous sight in east of Jeju by just 30 minutes. And the beautiful beach is just 5 mins walk from the hotel. there is no facility guide book in the hotel room. you have to ask the hotel staff where is the spa, pool etc and the charges involved. relatively nice hotel with good seaview. stay was relaxing but far from major tourist attraction. cost abt won per day to book a cab for sightseeing around the island. abt an hour ride to most attraction. but the room is nice and comfortable enough to make up for this shortfall. overall, the ambiance of the hotel is really great for vacationing people like us - people who would want to stay away from the hustles of city life. i find the amenities complete and i particularly appreciated the fast internet service. the sea view is a definite additional advantage. the location though is a bit far if you're a first timer in the island and you would want to visit key sites or attractions. you would have to stay longer just so you'll have the time to visit these places. it would have been better also if the staff can speak better english so communication will not be as difficult. Although this hotel is about 1 hour drive from Jeju town center, it is in fact quite remote. It is near to the sightseeing points in Jeju. We hired cars for our travel so I did not see the inconvenience of the location of the hotel. The facilities in the room are good but room service is not up to standard, I would say. The room is not tidy up every we come back to the hotel in the evening and the uncleaned cups are not washed up. Besides, the shampoo, body wash & conditioner have not refilled at all during our 4 night stay!! This part is disappointing but the view from this hotel is quite good. there was a kind intern but one of concierge was unkind. location is far from tour spot. so silent almost of day. sungsan-sunrise mountain is near from here. I didn't know what to expect when I first arrived in Jeju, and the hotel and resort made it so I almost didn't want to leave and instead just spend the day walking along the grounds, lounging in the pool, and getting treatments at the spa. But the concierge was helpful in negotiating a taxi for the day for me so I had my own personal driver to get around the island. My suite was AMAZING and the dining was superb. The only downside was the location. While located right on the beach, it took a bit of a drive to get to the destinations I wanted to see. The room is old and it doesnt even have bathtube. They don't even made the bed for our 3 days of stay. Th resort room doesnt deserve the price they charge. Definitely not recommended. i'm travelling around 80 days every year across asia with staying in 4 or 5 star hotels. first of all, the hotel/resort is not worth the price. i arrived at 9pm and needed to ralize dozens of hairs in the bathroom. i showed the concierge where to find the hair and gave them 2hours to clean it and spend serously $30 for three beers at the bar. when i returned 30% of the hair was removed. i complained to the duty manager but told him to fix it the next day but that i expect a compensation for this desastreous handling of this issue and inconvinience. the next day, i catched the cleaning lady when leaving the room, called her into the room again, showing her the hair she hasn't cleaned again and asked her to clean it. the room is big but there are no ameneties except shower wash. note even cotton buds. no umbrella, no do not disturb hanger or sign available. the staff is friendly but uncapable and the couch looked as someone has emptied a whole bottle of coke over it. the balcony was dirty and the pool was closed. the price for the hotel/resort, restaurants and bars are incedibly high and due to remote location are alternatives rare. i came to a conference and I received a room at the resort - not the hotel part. which is a stdio apartment size room with 3 beads and considered locally as condominium, its most suitable for families, but not for business traveler, room service not available and when i convinced them to service me they nicely agreed but charge me 35 USD for a piza, while they put ad in the room for 13 usd piza. they probably have good explanation, but they dont speak english, will not comeback there.